“When starting your design conquest whether it’s a remodel or for your new home, it’s important to decide beforehand what types of materials you are comfortable with and what you are trying to achieve within your space. Make sure you consider what level of maintenance and care you are willing to devote to your surfaces, this will help you to choose your finishes” says Hampleman. Once you’ve selected your materials it is most important to hire a reputable installer. “I’ve seen lower price point materials brought to life from a good install and also gorgeous materials completely fade from a bad install” says Hampleman. A good installation will not only be appealing to the eye, it will also ensure that your space will age properly and you will not experience issues down the line. Missoni prints, Ikat woven textiles, and Tribal prints are leading the way right now in both fashion and interiors. Bold colors accented with calm neutrals create a modern space with personality. 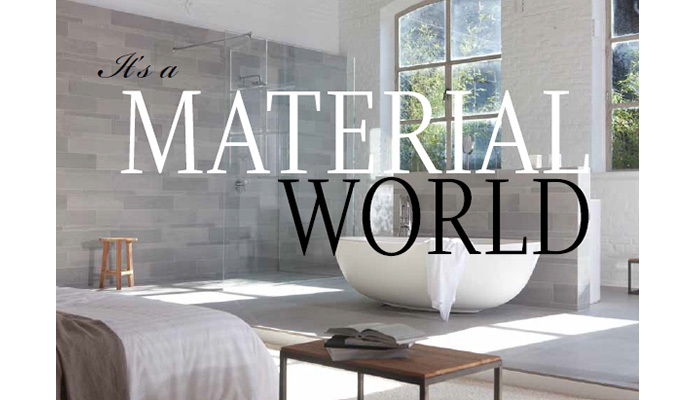 What used to be found only in wall coverings has translated into tile, stone, concrete and glass materials. Textured neutrals are a way to add interest to a monochromatic space. Mixing the same stone in several finishes creates a soothing spa-like atmosphere with an updated style. It also allows the homeowner that likes change to easily switch paint colors in the bath to create a new environment without replacing finishes.